Mikhail Gorbachev wants to come back!!! Former (and last) soviet leader Mikhail Gorbachev, 78, said he is thinking of a political come back! Gorbachev who’s been heading charitable organization since the early 1990’s but recently (re)-started to make political statements. Intriguing enough for a man who has everythhing to win in politics and so much to lose. Former Soviet leader Mikhail Gorbachev criticized Kremlin policies Friday and toyed with the ambitious idea of attempting a political comeback. Gorbachev said that corruption and overdependence on oil exports have aggravated the impact of the global economic crisis on Russia. He urged President Dmitry Medvedev and Prime Minister Vladimir Putin to restructure the economy, cut down government spending and ensure political freedoms. But he also suggested everyday Russians must shake their reliance on government largesse that has been boosted by energy price hikes during the past decade. Gorbachev said his concerns about Russia are prompting him to consider a more active role in politics. He spoke hesitantly, however, and seemed to acknowledge he would have a hard time winning active backing, even from like-minded people. Gorbachev, 78, remains popular abroad for the role he played in ending the Cold War and liberating Eastern Europe from Moscow’s grip. He was cheered enthusiastically by Germans this month at celebrations commemorating the 20th anniversary of Berlin Wall’s fall. But he is disliked by many Russians who blame him for the collapse of the Soviet Union and the years of social and economic turmoil that followed it. 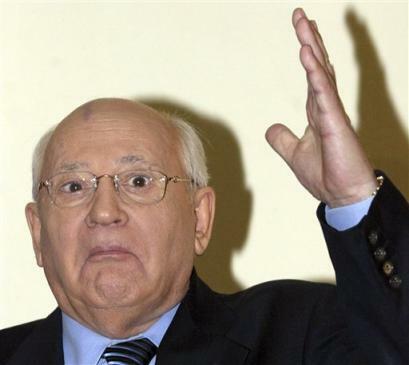 Gorbachev has maintained a relatively low profile since stepping down as Soviet president in 1991 as the country disintegrated, and his political ventures have little success. In 2001, he helped found the Social Democratic Party of Russia, but resigned three years later in a dispute among its leaders about working more closely with the dominant Kremlin-backed party, United Russia. The Social Democratic Party later was one of several ordered closed by the Supreme Court under new registration rules critics said were intended to help the Kremlin consolidate power. In 2007, Gorbachev was elected head of the Union of Social Democrats, which was formed with the goal of challenging the Kremlin, but its emergence went widely unnoticed.